So, Panera’s Cream of Chicken and Wild Rice has always been one of my favorite soups. In fact, I would plan my Panera trips based around the soup schedule as much as possible. Considering that I’ve traditionally been iffy about soups, that’s saying a lot. And my senior year of college, I spent a lot of time at Panera working on my thesis so I ate this soup all. the. time. I don’t even want to think about how much moolah I invested in the growth of Panera and Coffee Expressions that year… I blame my thesis. 100%. Now that I’m a married grad student who has a little more self-restraint and a little more care as to her budget, I have had to make some changes. Instead of $4 lattes during a busy school session, I make my own coffee at home. 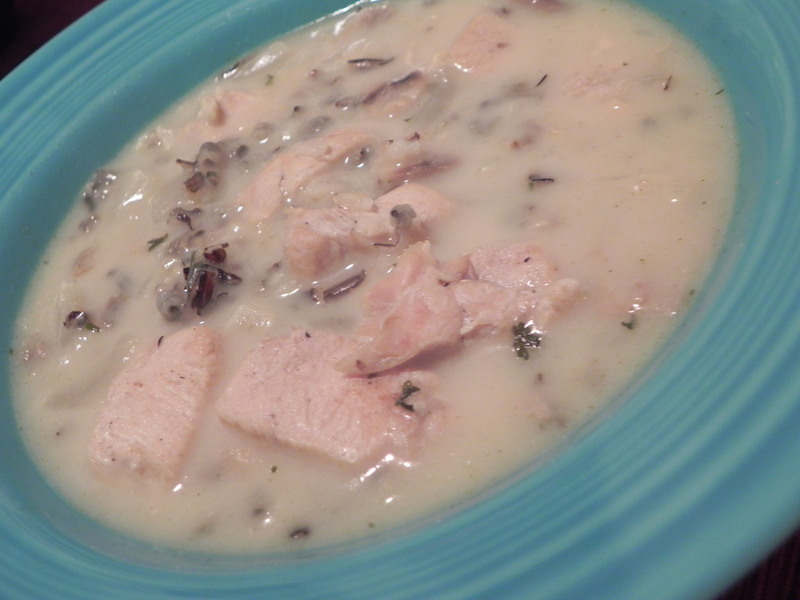 Instead of Panera’s smooth, rich, and creamy soup, I make my own Chicken and Wild Rice Soup. And let me say… I think it is just as good, if not better than Panera’s version since it is lighter and less salty without compromising on the flavor at all. Next time I make this I think I’ll plan ahead and get some extra veggies–maybe carrots?–to add to the mix, and perhaps some fresh herbs for texture too. But even without, this soup is phenomenal… this was one recipe that I didn’t pawn all the leftovers off on Ben! In a saucepan, cook brown and wild rice according to package directions. I didn’t want to use two separate pots even though the cooking directions varied slightly so I just added 3 cups of water to the rices, brought everything to a boil, and then simmered for about 45 minutes until all the water absorbed. Meanwhile, in a skillet, heat up a little olive oil and then saute the chicken, mushrooms, onions and garlic until the chicken is cooked through and everything else is soft. Remove mixture from heat. In a large stockpot, combine the chicken broth, parsley, thyme, sage, and pepper. Whisk to combine. Gently stir in chicken mixture, then bring to a boil. Reduce heat to a simmer and cook for about 20 minutes, stirring occasionally. In a small bowl, stir together evaporated milk and cornstarch until smooth. By this point, the rice should be about done. When it is, add the rice and milk to the stockpot and stir until fully incorporated. Return to a boil and cook for about 10-15 minutes or until soup is thickened to desired consistency. Enjoy! Question of the Day: What are some restaurant foods you like to recreate at home? Panera soup is great, but it’s hard to beat the homemade stuff, isn’t it? I’ve only ever used evaporated milk in sweet recipes (fudge, pies, etc. ), so I’m interested in its use in a savory recipe like this one! There is nothing quite like a good bowl of homemade chicken wild rice soup! This is a staple in my kitchen because it’s a MN tradition to have this soup. This looks good and will be on the menu for a future Soup Saturday Night. As for your question, I have not tried to recreate too much from restaurants. My husband recently made cheesy garlic biscuits using mozzerella instead of cheddar because that is what we had on hand. Next time, he will make sure to have cheddar instead. I made this soup over the weekend using white rice instead because that is what I had. The family loved it.